In our continuing devotion to enriching tango in Cambridge and bringing the Argentine tango culture to the East of England and especially the Cambridge tango scene, Tangueando arranged an exclusive visit in Cambridge of this well-known milonguero and tango teacher from Buenos Aires, Argentina. 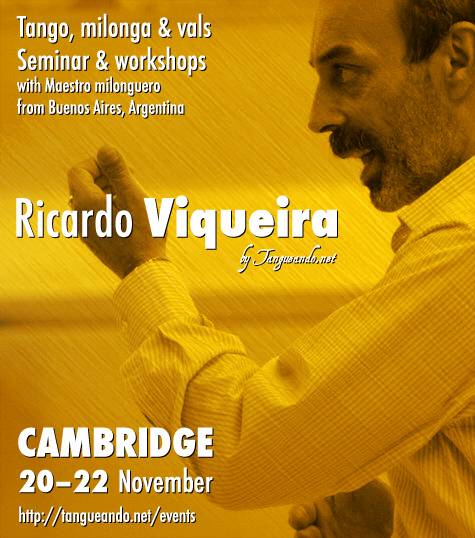 In his second, exclusive visit to UK, Ricardo visited Cambridge where he gave a number of tango, milonga and vals workshops and a Tango seminar. Ricardo is known for his ease, elegance, musicality and masterful footwork as well as for being a passionate and inspiring teacher. Ricardo will bring us closer to the reality of the Buenos Aires milongas and the milonguero culture. He is one of the most respected and sought-after teachers in Buenos Aires where he regularly teaches and in the rest of the world is well known exponent of the "milonguero" culture. He has been invited to teach in Italy, France, Spain, Germany, Portugal, Romania, Serbia, Switzerland, Brazil, the United States, Korea and China and this was his second, exclusive visit in the UK! MILONGA 1: Milonga lisa, musicality. Vals: Giros and contragiros, musicality.